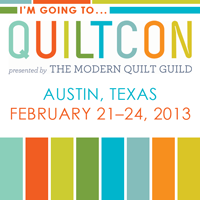 QuiltCon is just a day away!! I am so excited I may pee my pants! First QuiltCon EVAH! This entry was posted in Crafts, Quilting/Sewing, Quilting/Sewing Places, Road Trip and tagged Austin, QuiltCon, quilting, Quilting Places on February 20, 2013 by Tammy. I am in a funk today. You ever have those? The ones where you just want to run away screaming from all humanity and hide in a cave for a week? Last week I sent an email to a co-worker asking her opinion on a question. It was a simple question, or so I thought, that would just require a “Yeah, that works for me” or “No, I’m not comfortable with that.” Either way, it was no skin off my nose I was just kinda thinking out loud via email. Apparently, that’s not necessarily the best thing to do. It turned in to this big deal and I’m still not quite sure why. But…it is what it is. That, along with a bunch of other small stuff is just building up to a crescendo. Eventually, something has got to give. The question is what. If I can just make it to May, I’ll have 9 days off while I’m floating on a big boat toward Alaska and I can’t wait! This brings up another stress point, however. My habit of overeating on vacation is gnawing at the back of my mind. I’ve made a lot of healthy changes over the past 2 years and suddenly I’m worried that I’m going to lose all of that if I decide to indulge a little bit. That is just plain silly! Or is it? There is a strong possibility that I could overindulge one too many times and not workout while I’m cruising, which then would put me in the “I’ve screwed up so badly what’s the point? I’m always going to be fat.” mindset and THAT could very well be my downfall. So, what’s a girl to do? Think it through and visualize how I want to be while I’m there. I’m usually an all or nothing girl when it comes to stuff I’m hooked on. For example, sugar (52 days and counting) and diet coke (3 years). Does that mean that I won’t ever eat sugar again? No, realistically I know that’s not going to happen! However, I need to be more aware of what sweets I do decide to eat. Instead of eating chocolate covered strawberries, almond M&Ms, chocolate cake (see a theme here?) I need to pick one dessert that will be rich and luscious and the ONLY item I allow myself that day, or maybe even for the week. If I keep trying to mentally prepare myself, I think I’ll be ok! What tips and tricks do you have for surviving vacation without gaining weight? Need a laugh? Or just an idea for long flights? This entry was posted in Adventures, Food/Drinks, Road Trip and tagged Alaskan Cruise, Sugarfree, Temptation, Vacation on April 11, 2012 by Tammy.